Not a bad life. It's been sitting in the same rose for 48 hours now. Is it native to uk? cute critter, unless one is a bee? did that go badly for ms buzz? The victim's a hoverfly. Didn't end well for him/her. oooh so it is (was), some have quite a set of jaws but not as difficult a meal as a bee in extremis. 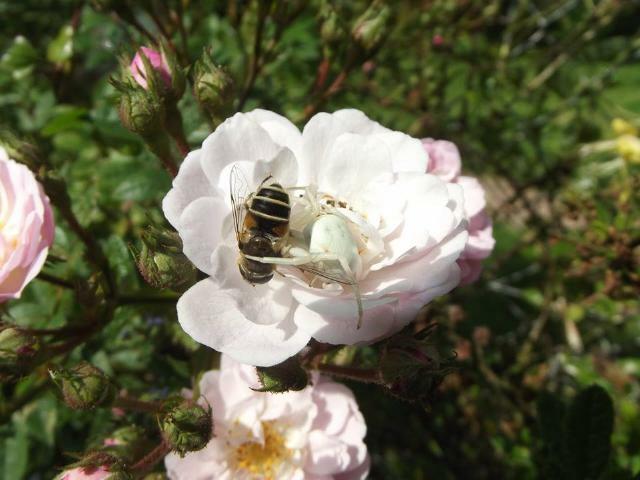 As I recall, Gerald Durrell's white crab spiders changed colour (slowly) if moved to a red flower. The hoverfly is probably a species of Eristalis, but they need looking at carefully through a lens to be sure of which one. 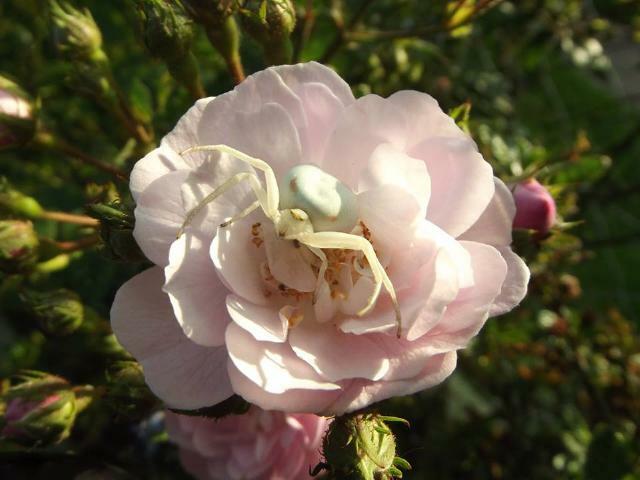 The spider is probably Misumena vatia, which does indeed change colour depending on which colour flower it is sitting in. This one is a female. It blends in amazingly well. Did it move after it had eaten? They are incredible things aren't they! Well, why move house when the food is delivered to your door? Didn't want a make over! Or a bigger predator turned up.